Over on Diving for Pearls Michael Kravitz is in the middle of a week of reviews of unsherried Glendronach (you should go check it out). Me, I’m much more conventional: I have a review of the standard issue 18 yo, the Allardice. I’ve had my eye on this one for a while but the price, north of $100 pretty much ever since it showed up, kept me from buying a bottle. I should also say that when I got a taste of it some years ago I thought the 15 yo was better anyway. However, thanks to the fact that in the EU this costs less than the Glendronach 15 “Revival” does in the US, I finally plumped for a bottle. And (spoiler alert) I’m quite glad I did. I’m not sure, by the way, what the mathematics on this one’s age may reveal. I know that the early editions of the 15 yo had to be quite a bit older than 15 (based on when the distillery was on hiatus) but I’m not sure if that’s true of this as well. Doubtless someone will be along soon to clarify. Let’s do another Glendronach. Unlike yesterday’s 20 yo this one is from a PX cask and was a US exclusive, I believe. I’m not sure if the distillery is still putting out “single casks” in general release in the US or if they’re only doing store exclusives now. While the last PX cask Glendronach I had was no great shakes, I’m hoping this one will be as good as the excellent UK exclusive PX cask 4681, a 15 yo from 1995 which was my first ever “single cask” Glendronach (I still have a large reference sample saved; I should review it sometime). A little over a year ago I published what has probably become the most read of all my whisky posts: my report on Glendronach’s somewhat freewheeling use of the term “single cask”. This post has been in the top 10 most read pages on the blog every month since, and it seems like it gets linked to on some whisky forum somewhere in the world for the first time every week. While whisky geeks seem to find the question interesting they also seem to have largely shrugged at the practice. There hasn’t been any sort of sustained outrage, and nor have there been calls for Glendronach to clarify their practices or use less misleading language on their labels—I haven’t myself purchased any of the single cask releases since then and so can’t confirm if there has in fact been any change on that front. With a name like “Three Generations” this whisky doubtless has some complicated story behind it. However, I’m too tired to track it down. I’m not even sure if it is a single cask. 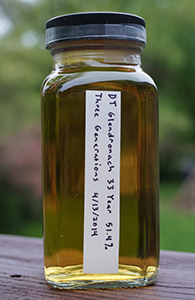 I know it is comprised of whisky distilled in 1975 and is, unusually for Glendronach, not from sherry casks. This sells in the vicinity of $300 in the US (where still available) but it was recently discounted heavily in the state of Oregon and this discounted price was split further between me, Jordan D. (of Chemistry of the Cocktail), Michael K. (of Diving for Pearls) and Florin (master of the oyster dance). Let’s get right to it. These days it’s hard to throw a stone in the whisky world without hitting a single cask release from Glendronach (though it would probably be a good idea to not throw stones in the whisky world, were one to actually exist). It feels like there’s one every other month. We don’t really get any of these in the US usually, and so it’s nice to see this release from K&L of an official oloroso sherry cask from 1993. 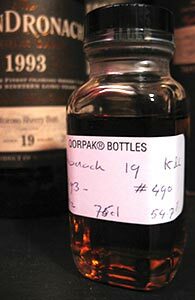 I have already reviewed another 1993 oloroso sherry cask release from Glendronach (also 19 years old) and you can read my take on that one here.